I read and reviewed one novel in the DI Mariner police procedural series, and was so impressed that I decided to go back to the beginning and read them all. Deadly Lies is the book that introduces Inspector Thomas Mariner of Birmingham, England. When a young journalist named Eddie Barham is found dead in his home of a drug overdose, the initial assumption is suicide. But Tom Mariner is not convinced, especially since he happened to see Eddie, alive and well, in a pub talking to a woman shortly before the time of death. He wants to locate that woman and find out what she knows. Meanwhile Eddie’s sister Anna, a career woman, is left responsible for their brother Jamie, who is severely autistic. At first she’s overwhelmed – Jamie needs constant supervision, and the demands are killing both her career and her social life. One man she is seeing a lot of, though, is Inspector Mariner, whom she finds very attractive. He reciprocates her interest. Meanwhile, crime scene evidence shows that this was definitely a murder, and somebody is trying to find and destroy Eddie’s records. What was he investigating, that would be worth killing to keep secret? The answer, I’m afraid, was a bit of a cliché. However, I thoroughly enjoyed the journey through the story for its own sake. 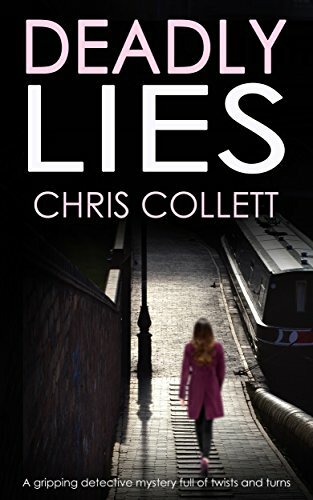 I like author Chris Collett’s writing; I like his characters. I suspect his politics and mine wouldn’t coexist well, but some very good values shine through the books I’ve read so far – especially the value of all human lives, and the importance of people having children. Recommended, with cautions for language and sexual situations. Following your lead I obtained one of Chris Collett’s books from my local library. I discovered Collett is a teacher and mother of two children. Ha. Fooled me. I like to imagine that I can tell women writers from men writers just by their styles, but Collett pulled the wool over my eyes. I’m impressed. In the novel I’m reading a female character and her husband are at odds over having children, which he strongly opposes. I remember your disappointment with the direction Peter Robinson was taking his female cops in the DI Banks series. He’,s a great writer, but I agree with your reaction regarding placing them in harms way and the questionable empowerment he gives them. As to Collett, I’ve noticed the difference in titles sometimes between British and American editions. Happy reading, and God Bless!